If you’re a fan of the late rap star Tupac Shakur, then you might be interested to know the last vehicle he ever purchased, a Hummer H1, will soon be available at auction. Shakur reportedly purchased the custom Hummer only a month before his unfortunate passing. Two pieces of registration accompany the Hummer, which show that 2Pac purchased the vehicle on August, 16, 1996, and that his mother, Afeni Shakur, later took ownership of the vehicle. The very same Hummer was raffled away by BET back in 2003 and the automobile was again auctioned away via eBay in 2007. The Hummer has remained in storage for the last several years and there’s only 10,101 miles on its odometer. There’s been a lot of custom work that’s been done to the Hummer, which RR Auction reports the late rapper had done himself. The exterior of the vehicle features diamond-plated bumpers, a 360 degree spotlight, a grille guard, 12,000-pound winch, oversized off-road wheels and tires, and an external PA system with three sirens. Underneath the hood lies a 6.5-liter turbodiesel engine that’s paired with an automatic transmission. As far as the interior, it comes with beige leather upholstery and is trimmed in burl wood. 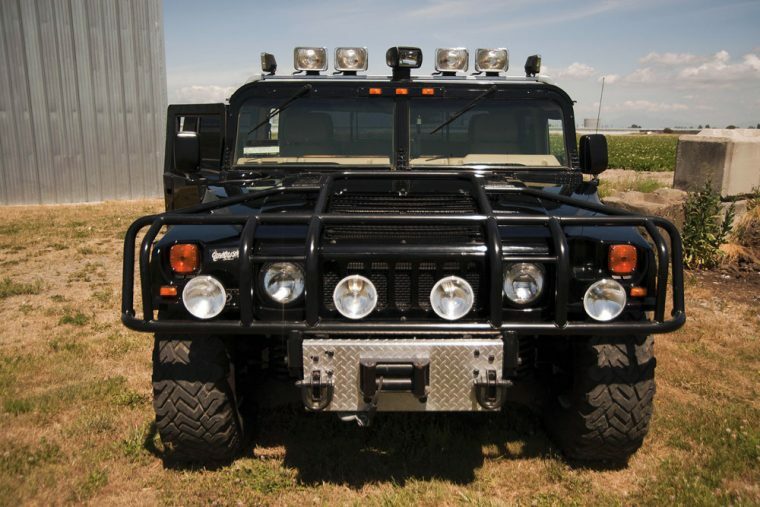 In addition, whoever wins this Hummer at the upcoming auction can listen to old 2Pac records on the vehicle’s 12-disc Clarion sound system, while privacy glass ensures the driver goes unnoticed on the highway. Other interior features include a Sony GPS system, a rear sliding glass window, and air conditioning. To sweeten the pot at the upcoming auction, which is being held from May 12-19, the winning bidder will also receive promotional cassette tapes of Michael Jackson’s Thriller and 2Pac’s All Eyez on Me. RR Auctions has estimated that 2Pac’s former Hummer H1 is worth more than $100,000.